Between the bottle half-full and the bottle half-empty, most of us opt for the first option, time and time again, but that is not enough for the arrival of summer. With six months ahead of us to plan with time (and with our heads) how we want those days off to be, it is not a bad idea to opt for that romantic trip full of luxuries that we have always wanted to do but never did because we never found the perfect time to do it. What is the perfect destination? In Hotels & Destinations we are certain: Ibiza. Far from that bustle that characterizes the island in the month of August, there is nothing better than getting to know the white island in the month of June (or even in May). This is simply because the island in these months begins to be reborn, its Mediterranean sea looks cleaner than ever and the leisure options are exclusive for all those who choose the island in these months. Which are the walks that you absolutely must do or the experiences that you can‘t miss? This month we are bringing you a luxury Ibizan trip to suit all budgets. They say that all the magic of the island of Ibiza is concentrated in Dalt Vila so it is considered one of the most romantic and charming parts of the island. Enjoying the setting sun whilst losing yourselves in the streets of Dalt Vila is one of those ideas that you will always want to try. Although our recommendation for dinner will take you to another corner of the city, there is nothing better than opening your taste buds to dinner with wine in some of the taverns you will find in the old city. Part of the philosophy of the ‘Adlib’ fashion was born in the port of Ibiza, on those nights by the sea with the sounds of drums and guitars in the background. With several restaurants offering fresh fish and cold champagne, this area promises a perfect dinner for two with an impressive setting of luxury and glamor (for something is the place where they meet the personalities that visit the island). Whether heading to Formentera or enjoying a highly romantic day on the high seas, there is nothing like renting a boat to experience a whole day at sea. Since in the early days of June the beaches of the island are practically deserted, you shouldn’t miss visiting the coves that can only be reached by boat. Romantic by nature, Ibiza is a perfect place to enjoy a romantic and unique holiday. Although you can find lots of hotels on the island, there is nothing better than choosing the Iberostar Santa Eulalia hotel. Located in the heart of Santa Eulalia, one of the most beautiful localities of the island, the hotel in Santa Eulalia, Ibiza offers exclusive services for two such as a beach club and even soap and bonsai workshops.or workshops. In addition to these things, it is enough to see the quality of the rooms of the Iberostar Santa Eulalia hotel to understand why it is considered one of the best hotels on the island. Although every tourist, every traveler and every visitor wants a specific destination; All those who visit Mallorca in the summer months agree on something: Few things are comparable to the natural beauty of the north of the island. Unknown to all those who prefer leisure of the Balearic capital (Palma de Mallorca) and the southern beaches (like the well-known and paradisical Es Trenc), the north of the island is the perfect place to enjoy scenery of immeasurable beauty, sea and mountain sports and entertainment for young and old. An area formed by geographical points that lend their names to the areas that we are going to tour today. Would you come with us? Although its population has a very high percentage of young people (when compared with other areas of the island), Cala Millor is a place where you breathe tranquility. A piece of the island where you can experience the word “vacation” in every sense. In this area of ​​Mallorca not only can you enjoy places of inland beauty like Sant Llorençs des Cardassar but its beaches stun in spots like S’Illot and Cala Bona. So with an exceptional gourmet tour and places where you can practice all kinds of sports, you can understand perfectly why so many people choose it for their holidays. The temple of the spectacular Playa de Muro (that which has led Mallorca to be compared with the Caribbean himself) and infinite sea front strolls, Can Picafort is much more than a beach destination. Perfect for cycling enthusiasts and for families seeking tranquility and leisure, this area of ​​northern Mallorca has everything and more for a perfect holiday. As can be inferred from the title, Alcudia is a paradise for lovers of water sports. A destination in which to enjoy the most beautiful Mallorcan landscapes whilst kite surfing, paddle surfing, kayaking, parasailing or even sailing with an instructor. Where to stay in northern Mallorca? The northern part of Mallorca is characterized by having high quality accommodation. Hotels with no shortage of facilities for big and small alike, are perfectly integrated into the area’s magical environment. So in Cala Millor our recommended choices range from the Apartahotel Ferrer Isabel (for its excellent service and facilities) in Can Picafort and in Alcudia, the Apartamentos Ferrer Tamarindos and Hotel & Spa Ferrer Janeiro, a unique hotel facing the bay of Alcudia. Ibiza has thousands of places where to enjoy a holiday, but if you are one of those travellers looking for calmness, tradition, the sound of the sea in the morning, sandwiches in traditional bars, walks around narrow streets and the Mediterranean at its best, Santa Eularia des Riu is your destination. It is said to be the perfect place for a family vacation, as it has the most relaxing and entertaining ambiance for children. In addition, it features tourist attractions for all ages, beyond nightlife and the great discos and clubs of electronic music of the moment. Santa Eularia des Riu is unique, not only because it features the only river of the Balearic Islands, but because it keeps the authentic essence that the island of Ibiza lost with the arrival of the mass tourism of parties, sun and beach. It is a small place of turquoise waters and white sand. Its beaches and coves are a beehive in summer, but much more welcoming and quiet than those in Sant Antoni, Sant Josep or Vila. Ideal for all type of travellers, Santa Eularia des Riu’s beaches are perfect for children due to their shallow waters and their sandy areas for walking and playing. Rocky coves, despite their beauty, might be dangerous for children and of difficult access. Regarding accommodation, there are thousands of options, as despite the calm and authentic ambience, Santa Eularia is one of the tourism centres in Ibiza. There you will find Adults Only hotels, hotels for children, classic beach hotels, hotels with chill out and beach club… Whatever you may need. Some examples of accommodations with a good quality price ratio are the recently inaugurated IBEROSTAR Santa Eularia, the Tropic Garden or the Fergus Paraiso Beach, located in Es Canar beach. For eating, do not miss one of the most famous sandwich bars in the island, the Costa Bar, and try its delicious cured ham sandwich. But if you want to try a more elaborated local dish, you will find options for all tastes in the historic centre of the village. Tapa hopping is also a must-live experience in Santa Eularia. It is true that in summer you will have to make your way through the crowd to get a tapa, as many people go to Santa Eularia to eat. For a morning or a cool night in the island, instead of visiting a disco, we recommend you an outdoor experience: the hippy markets. The Punta Arabi and Las Dalias markets are in Santa Eularia, one of them really close to Es Canar and the other one in the area of Sant Carles, one of the must visit villages of the island. Another of the villages near Santa Eulalia and considered one of the gems of the island for its traditional essence is Santa Gertrudis. It is also a good area for discovering some local delicacies, prepared with fresh products from the orchards of this small locality. In Santa Eularia, we recommend you walk up to its highest peak, Puig de Missa. It is worth the effort, as you will be able to contemplate a panoramic view of this coastal area of Ibiza. This village has good communications with the centre of Ibiza (Vila) and with the airport by public transport. The best option if you want to make the most of your time and to visit more areas of Ibiza or plan trips to its different beaches is that you rent a car or a motorbike. Buses are not the best option, especially if you are not going to stay in the island for a long time. 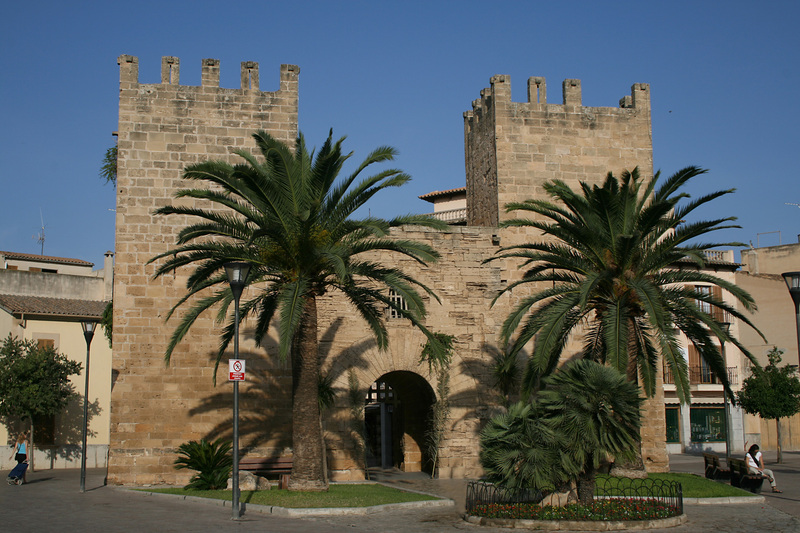 Alcudia: sports, sunbathes, gastronomy and spring! You can’t find any better spring destination than Alcudia for a spring break, north of Majorca, a small cosy coast that lead us to one of the most beautiful bays of this Mediterranean island, one of Majorca’s most authentic, natural and well preserved landscapes, making it the perfect place for all kind of outdoor sports while enjoying the calm and warm of these first days of spring. Alcudia was declared an ecotourism destination, it has a coastal zone of 30 km long with paradisiacal coasts such as the own Alcudia beach and the famous Playa de Muro, one of the favourite summer destinations for Europeans travellers, a place where you can experience the Mediterranean relaxation, thanks to its safety environment, its touristic services and its easy road access to the rest of the island and with Minorca by sea (ships sail directly from Puerto de Alcudia to Ciudatella). Despite being one of the most visited places of the island with a large quantity of hotels, Alcudia is still a place with tradition, culture and unexplored nature, such as the S’Albufera de Majorca National Park the largest of the island well preserved and famous thanks to its unique wildlife. The perfect place for family hiking, bicycle touring, or for enjoying a couple of days of ornithology, many travellers (especially from Britain) come to Alcudia only to be able to watch the unique bird species in the park. One of the main tourist attractions is the cycling and cycling tourism red all over Alcudia and it connects it with the rest of the north coast. One of the main routes is Alcudia-cape Formentor, at the edge of Serra de Tramuntana, a high level cycling tour, special for experienced trainers, it’s a secondary narrow street, very sloped, we recommend to be careful, since it is commonly used by rent cars and tourist buses that go to the top in order to enjoy one of the most spectacular views of the Majorca island. May not be appropriate for children. However, if you’re planning a family holiday, Alcudia in spring is full of family activities, since the Mediterranean water is still fresh (and it will continue this way until well into May), It’s a good plan to book your accommodation in Alcudia with sailing lessons, kitesurf course or kayak course, or other services that hotels offer inside and outside. A picnic at the beach is ideal to spend the day in family. The coastal zone between Alcudia and Pollença offers you that special place where you can relax next to the Mediterranean ocean and have a picnic under the pines. Just a few steps from the sea, it’s a place with tables and benches for a comfortable meal, besides, courts to play and of course, a warm place to sunbathe. Where to eat in Alcudia? If you’re looking for a special destination for a gastronomic weekend, you should add Alcudia to your route list, since it has many options where you can enjoy the authentic Majorca’s cuisine, not only downtown but in Port de Alcudia as well, new places like Restaurante Alcuina, near the docks, combine perfectly with the traditional tapas of Can Punyetes and the typical cuisine of the S’Oli Verge restaurant, a famous place in the port. There are other restaurants at the Majorca’s beach that you definitely should know, such as the Can Cuarassa, located in a typical Majorcan house at the beach, terraces and gardens with an amazing view to the sea. Another gastronomic jewel here in Majorca is the Sa Romana, an author’s cuisine restaurant (prices varies from 30 to 40 euros), a menu full of local flavours, enhanced with new culinary techniques, influenced by other Mediterranean cuisines. The place is meticulously decorated, a delightful terrace with an outer garden, perfect for spring nights. If you booked in a hotel in Playa de Muro or an aparthotel in Alcudia, we highly recommend you to visit at least one time, we promise you won’t regret it. Whether you travel alone, with friends or as a couple, Ibiza is the perfect place for a different and inspiring holiday. Although this island is always related to party and night, it is more than the electro music paradise. Ibiza is synonymous with peace, relaxation, game and sport. Sailing in the waters of the Mediterranean Sea, arriving to a deserted cove, exploring its history, its famous markets, contemplating the sunsets and tasting the delicious dishes such as bullit de peix is one of the best experiences you could ever have. Ibiza is everything you want it to be. And even more. This island has a complete range of hotels to choose from. Adults Only hotels, family hotels, beach aparthotels in Ibiza and luxury villas, 3-star hotels in Santa Eulalia, 4 and 5-star accommodations in Playa d’en Bossa… Getting an affordable rate will not only depend on the type of hotel you choose, but also on the time of the year you book. For this reason, if you are clear about travelling to Ibiza in summer, the best thing you can do is to take advantage of early booking deals that most of the hotels offer on their official websites. As for gastronomy and restaurants, food in Ibiza is very eclectic, dishes from a broad and diverse range of countries and an excellent selection of top level gastronomic spaces specialized in the regional cuisine. Planning a gastronomic trip to this island is a must if you want to know in depth the idiosyncrasy of Ibiza. Traditional dishes such as sofrit pagés, borrida de rajada, atún a la ibicenca or orelletes are the best representation of this island’s gastronomy and the best way to discover the real essence of this Mediterranean paradise. Leisure at day and night. The night in Ibiza is one of its main attractions. Besides boasting some of the most famous discos in the world, Ibiza has a bar area where you can have tapas and drinks next to the harbour. It is the meeting point of hundreds of people to begin the night. The sunsets in its coves or in any of the chill out bars situated next to the sea, such as Café del Mar or Kumaras, are a must-live experience. At morning, the perfect plan is to enjoy a traditional breakfast with olive oil toasts and then discover the wonderful towns of the island: Sant Antoni, Sant Josep and, especially, Santa Eulália, which is one of the most beautiful and cosiest towns, ideal for those who travel with family and want peace and rest. Markets and terraces located in the centre of Ibiza city are an excellent alternative to combine with a shopping tour close to the harbour. Later, you can visit the old quarter, the castle, walk the harbour and contemplate the beautiful yachts in summer, have an appetizer in a flat roof in Dalt Vila or visit a beach to sunbathe and get away from it all.